Tim Tate is Co-Founder of the Washington Glass School and Studio. Tim’s work is in the permanent collections of a number of museums, including the Smithsonian’s American Art Museum and the Mint Museum. He was the subject of several articles in American Style, American Craft and Sculpture magazines, as well as the Washington Post and Washington Times newspaper reviews. Tim was also the 2010 recipient of the $35,000 Virginia Groot Foundation award for sculpture. Tim taught in Istanbul in August 2007 and at Penland School on several occasions. In 2009 he received an award from the Museum of American Glass in New Jersey as one of the “Rising Stars of the 21st Century”. Tim received his Fulbright Award from Sunderland, University in England in 2012. He is also the founder of “Glass Secessionism”. Tim shows his work at numerous International Art Fairs, such as ArtBasel Switzerland, Art Miami, SOFA and Frieze, London. I see my pieces as self-contained video installations. Blending a traditional craft with new media technology gives me the framework in which I fit my artistic narrative. Contemporary, yet with the aesthetic of Victorian techno-fetishism. 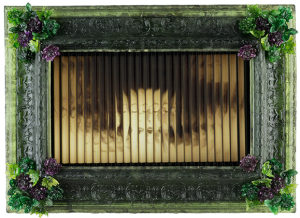 Revelation —, and in some cases self-revelation, — is the underlying theme of my electronic reliquaries and baroque cast frames. My interactive pieces can be seen as disturbing because the images that stare back from the video screen prompts a variety of responses: amusement, discomfort, embarrassment, something akin to the feeling you have when someone catches you looking at your own reflection in a store window as you walk by. My moving paintings examine the non-static nature of contemporary portraiture. But the important revelations here are in the viewer’s response to my hybrid art form and its conceptual nature. I try to bare everything — the guts of my materials and my inner thoughts — in deceptively simple narrative videos set into specimen jars or ultra-Victorian cast glass picture frames. Nothing is random, all elements are thought out. To me, these works are phylacteries of sorts, the transparent reliquaries in which bits of saints’ bones or hair — relics — are displayed. In many cultures and religions, relics are believed to have healing powers. 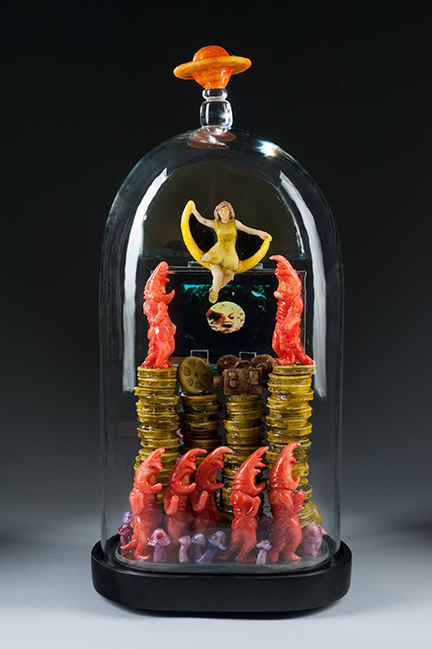 My relics are temporal, sounds and moving images formally enshrined, encapsulating experiences like cultural specimens. And perhaps, to the contemporary soul, they are no less reliquaries than those containing the bones of a saint. With technology rapidly changing the way we perceive art, the current day contemporary landscape closely mirrors Victorian times in the arts. We marvel at and invent bridges between past and present in an effort to define our time and make sense of this highly transitory moment in artistic history.